Over the last five years Ericsson’s Networked Society Lab has been exploring what social life in 2025 might mean. How have 20th structures of industrialization been challenged? What is happening with life and lifestyles right now? In what direction are we moving? How are values and attitudes changing? And what clusters of different lifestyles do we see emerging? 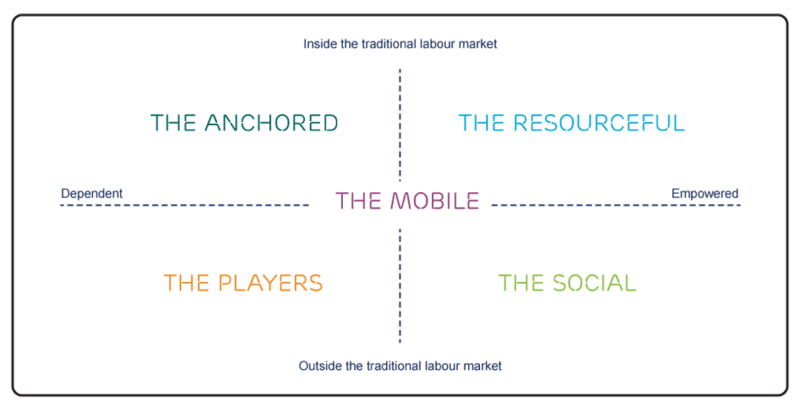 This leads to four macro level groups to consider: The Resourceful, The Social, The Players, and The Anchored. Into this model the Lab also plotted a fifth group they expect to emerge in the Networked Society, The Mobile.